Eobdtool supply powerful Autoboss V30 scanner and Autoboss V30 Emite Super Scanner for sale. 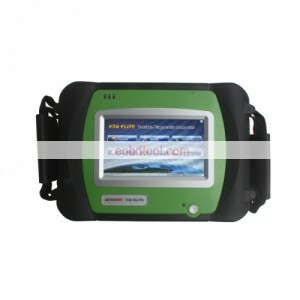 Both Autoboss V30 scanner and Autoboss V30 Elite super scanner are original, released by Autoboss technology. What’s different between Autoboss V30 Scanner and Autoboss V30 Elite Super Scanner? 1. autoboss v30 elite has 3 special functions: self-learn function, Comparison function, record function. 3. Autoboss v30 elite coverage over 57 manufacturers with up to 148 systems per vehicle, 4000+ car models. while autoboss v30 only support about 20 car brands and less car models. 4. Autoboss v30 elite support WIFI connection, while autoboss v30 support bluetooth connection. 5. Autoboss v30 elite package includes more connect cables and adapters than autoboss v30, so autoboss v30 elite can support more cars than autoboss v30. Autoboss v30 elite equipe higher configurations, functional than Autoboss V30, cover more cars than it as well. Recently my garage fixed a Citroen C2 equipped with 1.6L engine and manual transmission. It has about 130,000 km. The driver said the engine would not run when he started the car. I checked the storage battery and the power supply system. They were ok. I used LEXIA-3/PP2000 scanner to diagnose the engine system. There was no fault code. I checked the crankshaft sensor. Measured the electric resistance, it was ok. Replaced the crankshaft sensor with a new one. Tested the car. The engine still cannot run. I found that the fuel pressure was about 300kpa, which met the standard value. I checked the fuel injector. It was also ok. Then I checked the ignition system. Spark plug and ignition coil also had no problem. I used LEXIA3 diagnostic tool to test the BSI. No fault codes. Looked at the data stream. I found that the engine control module was locked. I brought the ignition key, BSI and engine control module from another car. And equipped them in the trouble car. The engine also cannot start. Maybe something wrong with the converter module of steering wheel or circuits of anti-starting system. So I changed the converter module of steering wheel. But, the trouble still existed. Measured the voltage. The 5th terminal is 0v. The standard valve should be the voltage storage battery. I checked the circuits. I found that in F4 fuse in BSI was broken. The ignition key cannot contact with BSI. BSI failed to send the unlock message, so the engine was locked. I changed the F4 fuse. Tested the car. The engine can start smoothly. 2015.7V Toyota Intelligent Tester-2(DST-2) for Toyota and Suzuki is a touch screen tool that enables you to diagnose control system for engines, ABS and airbag, even through CAN-diagnosis communication. Q1: is Toyota Denso IT2 with CF card? A1:yes, Toyota IT2 is with CF card, there is a CF card slot at the back of Toyota IT2 main unit. When you use the main unit, please do not take it off, CF card is used to store the tested result. Please refer “Toyota ITS2 Names of the Parts”. Q2:Is this new and with the oscilloscope too? A2: Yes, it is with oscilloscope . Q3: Can i use this product to do airbag coding? Bros! Good news! We obdtool now has released the newest version Ford vcm IDS V96! Have you updated to the new version IDS? Do you have any trouble in installing the VMware or else? Here obdtool technicians help you to install Ford IDS-V96 in VMware player with detailed instruction. Open “computer/ DVD RW Drive (E:) Ford Mazda IDS” to copy “en_windows_xp” to “Local Disk (D:)”. Click “Next” for installation wizard for VMware workstation. Select “I accept the terms….” and click “Next” to go on. Click “Next” on Destination folder. Click “Next” on Software Updates. Click “Next” on User Experience Improvement Program. Click “Continue” to begin the process. You will see an icon of VMware Workstation on Desktop. —Open “computer/ DVD RW Drive (E:) Ford Mazda IDS/VMware-workstation-KEY” to copy the key. Click “Finish”. The setup wizard has successful completed its operation to VMware workstation. Open “Computer/Local Disk (D:)” to establish a new folder named “VX DIAG Ford”, then minimize the interface. Open “VMware Workstation” on Desktop. Click “File” on the top menu for “New Virtual Machine…”. Click “Next” with “Typical” type of configuration. Click “Installer disc image file (iso)” and browse for “D:\en_windows_xp.iso” to go on. In Easy Install Information, copy the en_windows_xp.iso key to the “Windows product key” to continue. Name “VX Ford VCMII” as Virtual machine name, set Location —“Computer/Local Disk(D:)/VX DIAG Ford” , and click “Next”. Set Maximum disk size as “120.0” and click “Next” with selection of “Split virtual disk”on Specify Disk Capacity. Click “Memory” on the left menu, and set “1024” MB as memory of this virtual machine. Then close the Hardware interface. Click “Finish” to create virtual machine and start installing Windows XP Professional and VMware Tools. The date and time on your computer is the same as that on VMware. Close “VX Ford VCMII” interface on VMware Workstation. Remove “VX Ford VCMII” from library, and close the interface. Select “Organize” for “Folder Options/View” to cancel √ in “Hide explensions for known file types”. Find out the file (VX Ford VCMII.vmx) that ends with “.vmx” to open with “Notepad”. Copy the selected part in “computer/ DVD RW Drive (E:) Ford Mazda IDS/VMware-workstation-KEY” to the last of “VX Ford VCMII.vmx-Notepad” and save it. Click “file” for “Computer/Local Disk (D:)/VX DIAG Ford/VX Ford VCMII.vmx” to open “VX Ford VCMII.vmx” with “VMware Workstation”. Then,right click “VX Ford VCMII.vmx” for “Properties”. — in “VX Ford VCMII.vmx Properties/Gernal”, click “change” to make it open with “VMware Workstation”. Click “OK”. Power on this virtual machine. You will see the date and time on your VMware is different from that on your computer. Maximize your VX Ford VCMII. Click Start menu for “My Computer” to right click it for “Show on Desktop”. Open “My Computer” for “eject” “Ford Mazda IDS (D:)”. Open “Ford Mazda IDS (D:)/VCM DVD” for “Calibrations”. Click ‘”Next” to in install Shield Wizard. Click “Install” to begin installation. Click “Finish” to successfully install Calibration. Exit VCM DVD. And close other interface. Open “Ford Mazda IDS (D:)/ids-v91.01_full”. Click “Next” to install ISD. Click “I accept….” and “Next” to go on. An icon of “IDS” appeared on Desktop. Successfully install IDS, and click “Reboot” to restart your computer. Click “OK” on Removable Devices. Select “dealer type” and “country” and click the tick button to continue. Click “Continue” on IDS Software-Computer Date Synchronization. Click the tick button to exit IDS-91.01. Click “Next” to continue to update the installed version (90.01) of IDS to version 96.01. Click “Close” to install successfully. IDS has been updated to version 96.01. Click “Reboot” to restart your computer. You will be told that “Your computer may be at risk” after restarting. It is normal. Click the tick button to exit IDS-96.01. Open “My Computer/ Ford Mazda IDS (D:)/ VCMII Driver 2.2.0.1505”. Click “Next” to install VCMII Driver 2.2.0.1505. Click “Next” in Information page. Click “Finish” for installation of VCMII PLUS. Click “OK” for Removable Device. Connect the device to the vehicle and then install the driver. Select “Yes, now and every time I connect a device.” and click “Next”. Click “Click” with the selection of “Install software automatically”. The software for USB Serial Converter has installed. Click “Finish”. The software for USB Serial Port has installed. Click “Finish”. Right “My Computer” for “Manage”. Select “Device Manager” for “Network adapters/Ports(COM&LPT)/USB Serial Port(COM3)”, and “System devices/USB Serial Converter”. Select vehicle specification “2011 MY” and click the tick button. Click “YES” for the vehicle specification. In the following parts, I list all of Autoboss V30 detailed information, hope it helps. 3) More than just reading & clearing fault codes – go far beyond and access the Complete vehicle, including: drive me, chassis, body, and the networking/communication modules. 6) Cutting adge operation system: Windows CE. With V30, you can keep your work in house with coverage of over 57 vehicle makes and more than 40,000 systems. 10) Simple and direct interface gets right to the problem – quickly and efficiently. 11) Easy to use VGA colour touch screen. VVDI Prog programmer is the upgrade version of VVDI, to help more people know this tool, the poster write this post, this post consist of main unit picture, pcb board pictures, update history, main features, parts list, adapter description, supported chip list, etc. 1.1 2015-07-27 Add the read & write function for BMW engineAdd pin code calculator for multi-brand vehicle models. The built-in update software allows user to update VVDIProg firmware timely. Read the common EEPROOM, note: please insert the chip by following the below picture. SPX Autoboss V30/E30 Elite OBD2 scan tool raises a heat discussion in recent days, following are basic facts/reviews gathered from Technician, Mechanic, repairing businessman, DIYer etc, which will lead you a better understanding towards the autoboss v30 scanner. 1) The Windows CE format is relatively fast and easy to navigate. 5) This is the original SPX device and not a clone. The accessories are excellent, rugged and come in the brand-new updated storage case (not the previous storage case used). 6) The scanner has definitely paid for itself with European vehicles and Asia vehicle models. It covers a lot of cars, strong import and European. 7) The Hyundai coverage is great as, it is able to diagnose an EVAP unit on a 2001 Accent. 8) The unit is compatible with a learning and comparison mode. The AUTOBOSS V30 Elite scan tool can learn the data of a perfectly working vehicle for later references in diagnostics. The comparison mode takes the current data of the similar vehicle and compares it to the learnt data. 9) This V30 scanner can really deliver 85-90% of what a dealership scanner does. 10) This is a very good diagnostic system, take the time to learn about all of its functions and you should be more than satisfied. Work great in programming and functional testing. 11) V30 Elite is a good global scan tool for auto repair men who live abroad. 12) This is the affordable scan tool that comes with built-in mini printer, allowing print out the DTC information, diagnostic results, data stream etc. It is very helpful. 2) It has minimal coverage for Mazda and Subaru (no bi-directional controls) but did allow code retrieval/data for different systems. 4) One of its downside is that it does not provide a bigger image of a waveform. 6) Has a lot of diagnostic options on Infiniti G20, but did not have throttle and idle special functions. No OBDⅡtool is perfect, but this AUTOBOSS V30 tool is Boss. I have told that the AVDI Mercedes could renew ? Want to buy AVDI Mercedes / Smart / Maybach, where to and how to do it? Or do I need to go for a Star diagnosis tool instead? The following part displays the detail instructions on renewing Mercedes-Benz 7-Gear control units (722.9) with 2015 AVDI commander. 3.The Mercedes Commander will show the identification of the control unit. 5.Click on “Make Virgin”, the system will display warning message, click “OK” to continue. 1) Connect a battery charger to the battery of the car. 2) Plug the diagnostic connector and make sure it is correctly seated in the diagnostic socket. If you are using a laptop – connect it to constant power supply. It is also recommended to stop any screensavers, antivirus and other programs, which may affect the performance of the system. 6.The first time that you use this function, the software will ask you for the location of the database files for 7-Gear renew. Please browse to the folder where you have extracted these files and select it. 7.A progress bar will appear showing you the time and the completed percentage. Pleasewait until the procedure is complete. 8. When the procedure is complete you may check the “Actual Values” and verify that the Electronic Transmission Control unit reports that it is renewed. 9. Now, you should put the 722.9 unit in the car in which you wish to adapt it and once again connect to it and press the button “Adaptations”. Press the button “Get Coding”. Then for the option “Detach the transport protection, personalize and activate the control unit” select “Yes” and press the button “Set Coding”. Go back and check the actual values. If everything is OK the 7G unit should report that now it is personalized and you should be able to see the hashes of the keys. 10. If you have the old control unit available you may read the SCN coding and then write this SCN coding in the donot control unit. 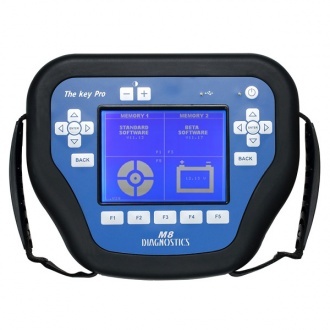 Key Pro M8 most powerful Car Key Programmer and Locksmith Diagnostic tool come with 800 tokens with the machine. Not all car models key programming need tokens, if your car needs token, the screen will promt you how many tokens are needed. Send us the M8 serial number, within 24 hours, we will notify you when you can update token. connect your computer to network, and then use the USB cable to connect the M8 and the computer. Plug the power supply cable into the M8, and then turn on M8 till the following window appears. The window “Found New Hardware Wizard” popup, tick off “Install from a list or specific location (Advanced)”, and then click “Next”. tick off “Search for the best driver in these locations” and “Include this location in the search”, and then click “Browse” to choose the installation location. After click “Browse”, choose the driver location: browse for Folder-Desktop-The key pro (M8) driver-OK.
click “Finish” and the wizard complete installing the software for the key Pro M8. stay in the following window even some change happens during the process. click “M8 Tool.exe” to show as below, “Serial Number” will be automatically indentified, input M8 6-digit password and click “Login”. in the drop-down list of “select TOKEN quantity” choose the TOKEN quantify you bought from the dealer, double click “Update TOKEN”. wait until you see the Current TOKEN number already includes that you bought, and click “Finish”. As for me , VAS 5054A ODIS V2.0 Bluetooth is usually used all part of time so that you can deal with many problems . The VAS 5054A ODIS V2.0 Bluetooth has highest performance and advanced technology , which many people can’t stop to like . There are some reason is listed why this tool could be . On the one hand , the VAS 5054A ODIS V2.0 Bluetooth with ODIS system Core advantage , which realize higher quality and lower cost on repair through high- efficiently diagnostic process . The language of the VAS 5054A tool has English , Japanese , Portuguese , Romanian , Korean , Dutch, Polish , Spanish , French , Italian, Croatian, Danish , German , Swedish , Finnish , Slovenian , Czech , Russian, Greek , Chinese and so on . And the VAS 5054A tool support the car models of VW, AUDI , SKODA , SEAT and Lamborghini . 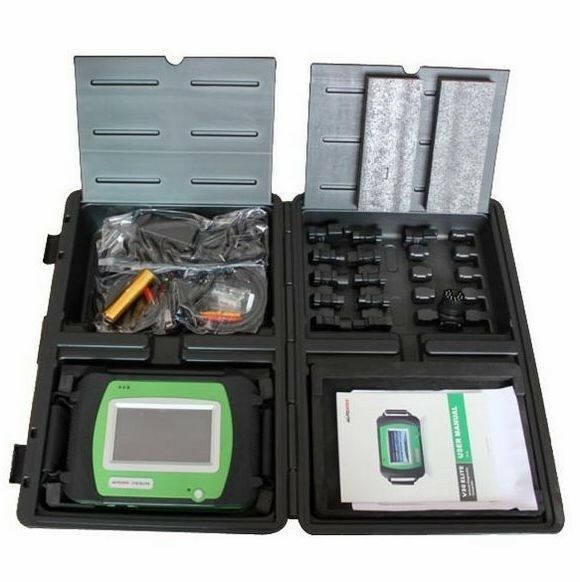 Beside , the VAS 5054A tool is a universal diagnostic interface for the vehicles of the Volkswagen Group and all OBD vehicle systems from other manufacturers . The integrated Bluetooth interface connects the vehicle with a notebook , desktop PC or test system . The range of the wireless Bluetooth connection is 2 to 5 meters,depending on the environment and the type of Bluetooth adapter used on the PC side . After a connection to the VAS 5054A has been set up, the Bluetooth software provides a virtual serial COM port . The Diagnostic Base System uses this COM port to communicate with the VAS 5054A tool . You need to specify this port when you install the diagnostic application . On the other hand , The vehicle protocols are handled directly in the VAS 5054A .This ensures fast response times and a reliable real-time behavior independently of the PC operating system. Every time a connection is established , the VAS 5054A software is identified with the version installed on the application PC . The VAS 5054A thus automatically adopts any new features provided after a new software version has been installed on the application PC . It’s connecting the VAS 5054A to the application PC by using the supplied USB cable. The VAS 5054A through Plug and Play, and automatically installs the drivers copied . Setup of the VAS 5054A is then complete and the device is ready for use by the diagnostic application. All in all , the VAS 5054A tool has more features and functions so that always can help you all part of time . It’s deserved to purchase .